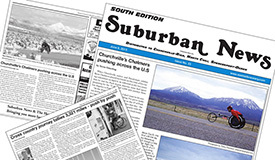 Literary journalism is also often called creative non-fiction, which includes articles on diverse topics of human interest and local significance for newspapers, magazines, and newsletters. How do women experience gender barriers in business? Do all women see gender as a barrier, or do there exist bigger, more important questions related to overall equity? When I asked four women about their experiences in business, they dug deep into the question; their replies were unexpected and eye-opening. This piece for The Rochester Business Journal, a local business-focused weekly, is an example of how the story tells itself to me, instead of me dictating the story. As a writer, I always have to be ready to hear the story as it is, instead of as I want it to be. 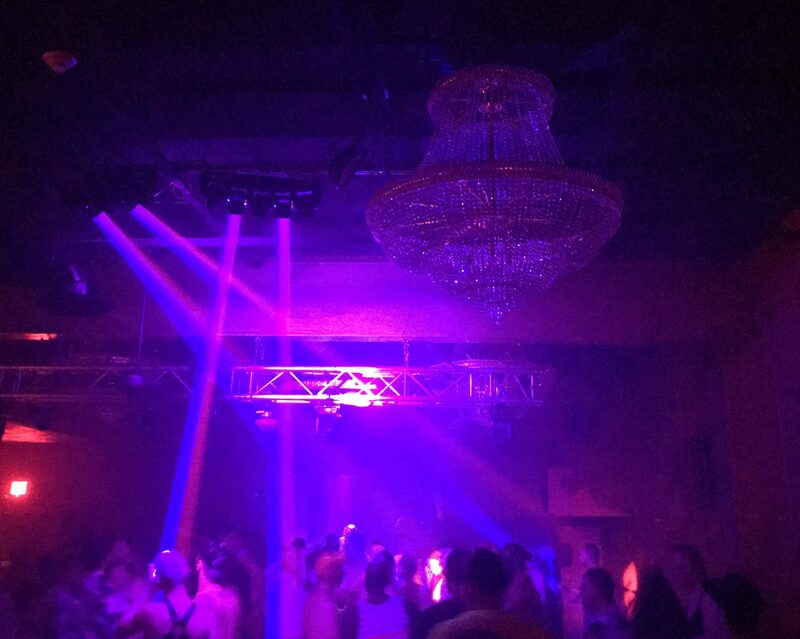 Read my article to find out what they had to say. This story examining the current state of contraception---access, in particular---was the most important piece of writing I've ever done. The Rochester Business Journal, a local business-focused weekly, includes a themed Special Report section. My piece for the Women's Health Special Report explores how the issues surrounding contraception affect women across the socioeconomic spectrum. I spent weeks researching the topic and interviewing women who have dedicated their careers to educating women about contraception. Talking to four accomplished, professional women about what they read for inspiration was a treat for this writer. 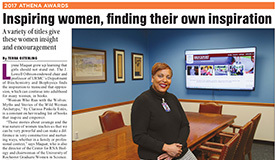 The Rochester Business Journal, a local business-focused weekly, publishes a special supplement in conjunction with the annual Athena Awards celebration. The Athena Awards are known as Rochester’s premier business awards and aim to celebrate the area’s most influential professional women for their significant contributions to our community – personally and professionally. Read my article about what inspiring women read for their own inspiration. 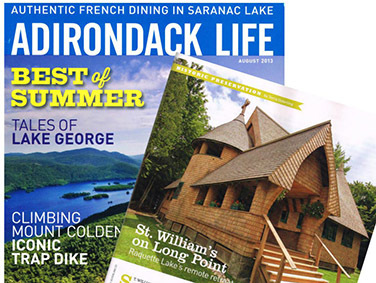 Adirondack Life is a a glossy outdoor lifestyle magazine focused on the Adirondack region and North Country of New York State, with a national circulation of 50,000. 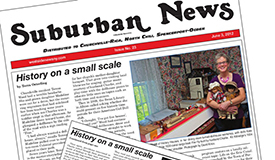 The idea for my story pitch came from the Betty Murphy article I wrote for Suburban News. St. William’s on Long Point is one of those hidden gems ‘inside the blue line’ – a breathtaking specimen of history and architecture set among the incomparable beauty and serenity of Raquette Lake in the Adirondack Park. 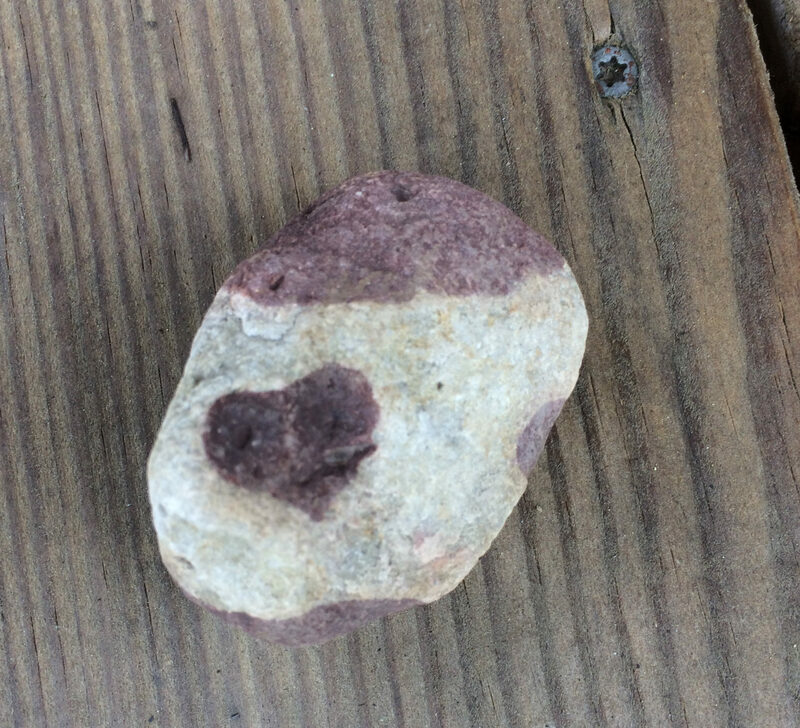 Visiting St. William’s on Long Point was an adventure in itself. Writing took place over several months, and included interviews with several key people to stitch together the story. Read my article about St. William’s on Long Point. 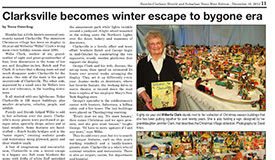 The story of octogenarian Willie Clark and her Christmas village is a study in family love. The marvels of ‘Clarksville,’ which takes up nearly a whole room, lie in not only the commitment to intricate details, but also in the entire family’s dedication to Willie and her passion for commemorating Christmas. Spending an evening with Willie and her family ‘in Clarksville’ was the highlight of my 2012 Christmas season. Writing about people has taught me that the seemingly ordinary person next to you in the grocery store represents a whole being, a loving spirit, and the rich details that make every life a fantastic story. Read my article about Willie and Clarksville. In the spring of 2013, Ryan Chalmers, a Churchville, NY, native and Paralympic athlete, set out from Los Angeles on a cross-country trip to New York City. He pushed his racer across the country to raise awareness for the capabilities of disabled youth and young adults. The event was staged to commemorate the 10th anniversary of Stay Focused, an organization that provides growth and leadership-development opportunities for disabled youth. I met Ryan’s family at their home in Churchville. During the interview, Ryan’s Dad dialed up Ryan on his cell phone, reaching him as he ate dinner after a 60+ mile day on the road. Ryan graciously answered a few questions, and we met in person in Rochester a week after he finished his 3,300 mile journey. Read my two articles about this extraordinary young man. Ron Zorn is an interesting man. 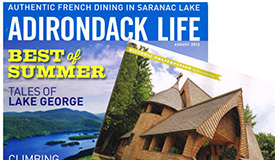 He and his wife Alice live in a beautiful house they built themselves, and travel the country visiting historic sites. The lower level workshop of their home is where thousands of lead soldiers stand ready. I spent an afternoon with Ron and Alice to write about his avocation of making lead soldiers, and arranging them in historically accurate battle scenes. So captivating was the story that I blogged about him here. 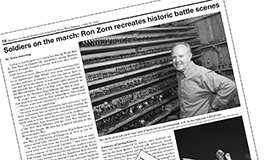 Read my article about Ron and his soldiers. Teresa Wood has a room in her own historic farm house dedicated to housing the many ‘history houses’ she has constructed to teach American history through various stories featuring young girls. Mrs. Wood uses props and her own engaging storytelling to bring alive the realities of life during the American Revolution, the Great Depression, life on a slave plantation, and even life on an Erie Canal boat. Meeting Mrs. Wood and learning her story is one of the perks of writing literary journalism. Great story telling starts with a great story, and everyone has a great story to tell! Read my article about Teresa and her History Houses. The Women of Focus Trade Show was an upscale event designed for women entrepreneurs to exhibit their products and services. The event organizers needed a new promotional feature article to submit for pre-event press coverage. 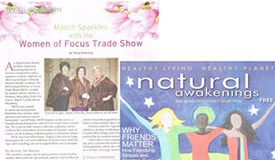 The final article was published in several local publications, including Natural Awakenings. 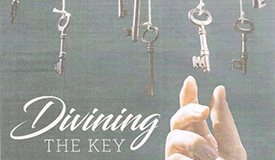 Read the issue of Natural Awakenings page 10. Donna Haire was part of my first major story for Suburban News, about new technology available at the public library. My first contact with Donna, a library director, didn’t go so well; she rarely felt it worthwhile to give any type of interview to a news reporter. Donna was skeptical, but somehow I reassured her that I would be very careful with the storytelling. I took that promise to heart, making sure to triple-check all quotes and details before submitting my article. This experience set the tone for my freelance writing work ethic. Donna loved the article. So much that she would routinely send story ideas to the editor with the explicit request that I be the writer to do the work. (These include Ron Zorn and Teresa Wood.) When the editor contacted me about Donna retiring and asked me to do the honors of writing about it, I jumped at the chance. Donna and I spent over three hours together chatting about her life and career. The hardest part was taking all those great stories and distilling down to one article. 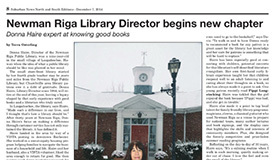 Read my article about Donna Haire, retired library director.